The Faculty of Fine Arts and Music Visual Art Winter School: Folio Preparation is a crucial intensive short course in contemporary visual art practice. Guided by a dedicated artist and industry professional, you will gain a fundamental insight into preparing your visual art folio; a pivotal asset of the professional artist. 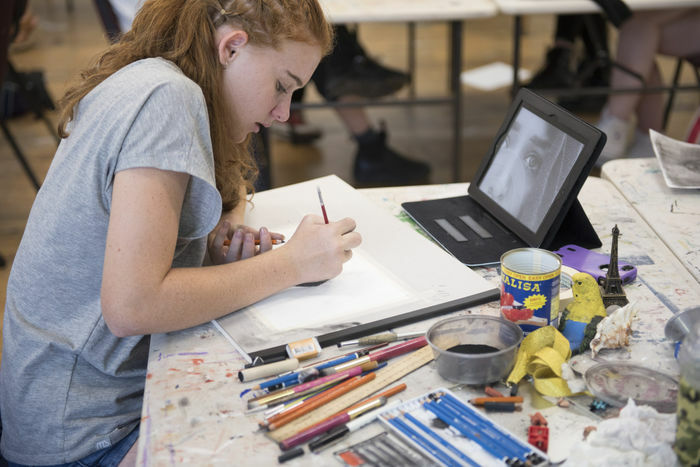 This workshop is perfect for those embarking on VCE study in visual art and those planning to pursue creative tertiary study in visual and fine arts at the Faculty of Fine Arts and Music or elsewhere. Trevelyan Clay has been exhibiting locally and internationally since 2006. His paintings are as much a celebration of creative experiment and discovery as they are exciting resolutions. Clay's compositions arise as visual intersections or collision points where the artist’s interests, experiences, and ideas converge. Clay has held solo exhibitions nationally and internationally and is represented by Neon Parc Gallery, Melbourne, Australia. His work is held in the collections of the National Gallery of New Zealand Te Papa Tongarewa, Artbank, Monash University of Modern Art, Australian National University, University of Wollongong as well as other private collections in Australia, New Zealand and the United States. Prior experience with visual art making (eg. painting, drawing, photography etc) is beneficial but not essential. This course is only suitable for 15 - 20 year olds. Students will need to supply their own materials.